Today I want to share an amazing, adorable and stylish nursery that belongs to one of my Etsy customers. 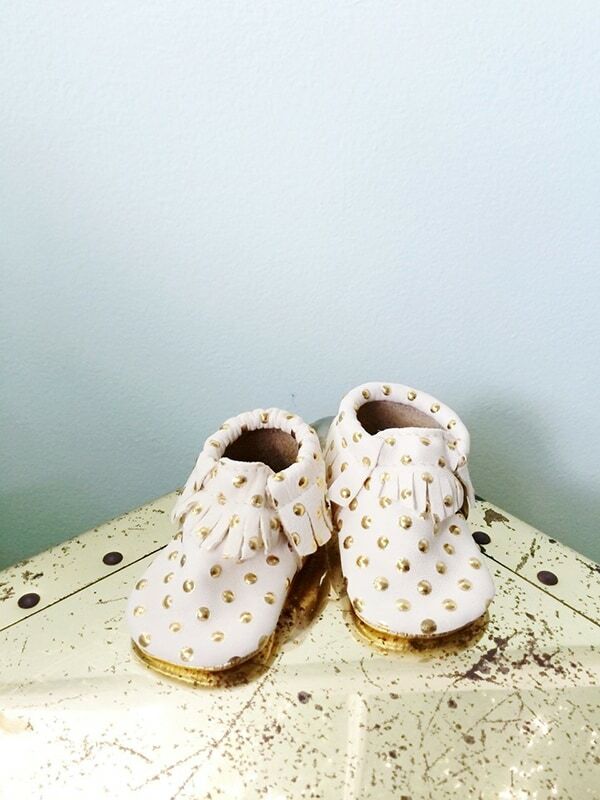 Rachelle bought my gold polka dots for her daughter’s nursery and I don’t think I could love her space any more. It’s just so darling. The chandelier (click HERE) in the space is from another Etsy shop called DuttonBrown and I have been obsessed with their creations for a long time. I’m actually currently saving up to purchase one myself. I usually don’t splurge but in this case I just have to. If you have been following me for a while then you know about my Emil Stejnar obsession and this will probably be my only chance to get a similar look. , curtains, rug and art. Rachelle is an actress as you can see by clicking on her website (or more about her HERE) and now every time I will see her on TV I will smile from ear to ear! Isn’t she beautiful? You can find my dots HERE! I have been contemplating that same scenario for about three years now. I wanted to make a similar version to Little Green Notebook’s chandelier, but I’m starting to figure by the time I bought the Ikea light, supplies and paint and all the time, I’m already at around $150-$200. So I just asked my hubby for an Etsy gift card for my upcoming birthday. Hopefully I’ll be able to order one soon 😉 for my dining room. 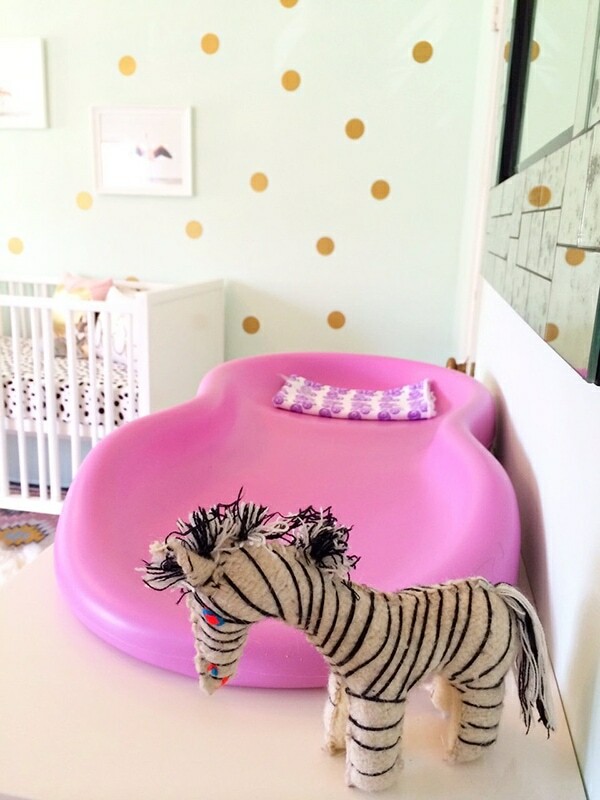 Oh my goodness, everything about the nursery is absolutely lovely! And that chandelier, oh my! Yes, that’s my favorite part! Very cute, I too like the color combination, there is nothing like adding some gold. The lamp is amazing! I will have to have a look at this Etsy shop. Thank you for sharing. Happy Monday! Yes you have to check it out and happy Monday to you too. She did such a great job. The rug is from Luly and Georgia. What a sweet room. I think I want to move in! I thought of you too with that chandelier. Haha, and I know someone who can hook you up. This is beautiful! All of it. Including that squishy dog on the floor! i don’t even know what to say- it’s amazing!!!!! where to begin- i LOVE it all! Shoot, this nursery is SO gorgeous! And that light is definitely worth saving up for…and I’m not a “splurge” type of person either! Yea, I’m not a huge splurge kinda girl either but I just calculated what I would need to even attempt a DIY and that would put me at half price already. And then it’s not even guaranteed it will turn out. Oh, so pretty! I love that rug and of course that fabulous light! It works so well together!!! I have to agree…..that Chandelier is a dream of mine also! This is just STUNNING! love everything about it and your polka dots were the perfect accessory! How awesome is that Julia! Such a beautiful nursery. I love the chandy and your polka dots are just what the space needed. Thank you so much for sharing with us. 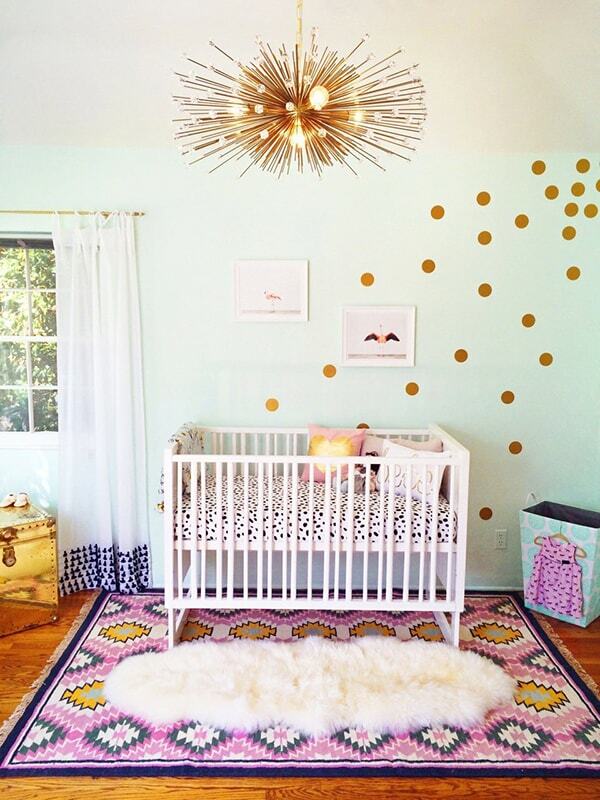 That nursery is seriously perfection. I literally just saw it on pinterest this weekend and pinned it. I love everything. The wall color, the rug, the light, the art. It’s amazing. Your gold dots look amazing in there. I love that rug and the chandy is gawwwwwwgeous. Has YOU written all over it! Love this space and the gold dots are perfect with that amazing chandy! Absolutely love this nursery! I’m all about splurging on those timepiece items… I like to have a good mix of DIY, thrifty and more expensive. Also… huge hive five’s to that Lulu & Georgia rug! Beautiful! I love this room too Julia! Your dots look amazing against that subtle wall color and she did a fabulous job making every minute of this room special. Love it! (And I want to steal that light fixture!) Hope you are having a great new year so far! Rachelle is the best and her nursery is jaw droppingly amazing. Thanks for linking to our podcast interview! Loved listening to it! She is beautiful and stylish! I LOVE this nursery. 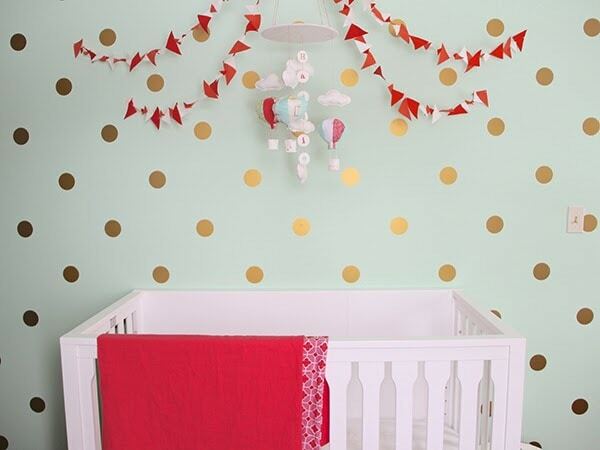 I feel like the gold dots really pull the mint wall into all the other decor. And I love the experience. I mean, how many people can say they’ve sold merchandise to an actress? Love it! That is one of the cutest nurseries I’ve ever seen – love it! 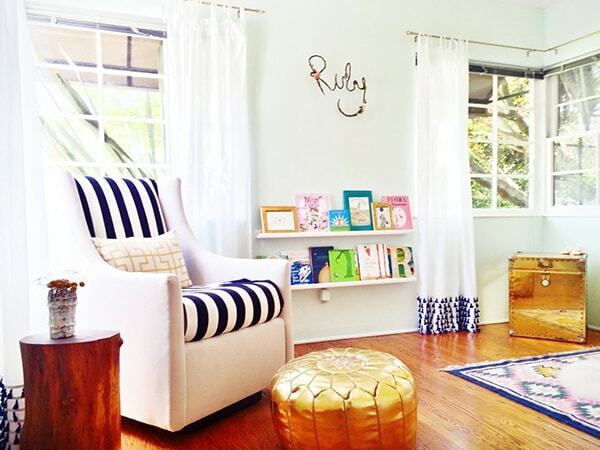 This is such a cute nursery! I just love the mint and gold combo! Your wall decals look amazing. What a perfect room and your decals add the perfect finishing touch! This is fantastic!! 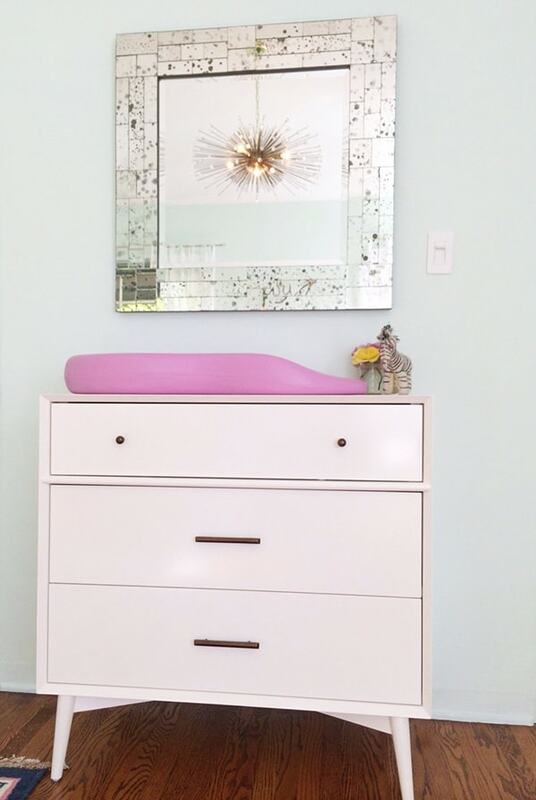 I’m currently looking for a pale mint for my bedroom–I’d love to know what paint color she used! It is Benjamin Moore “Cool Mint”. 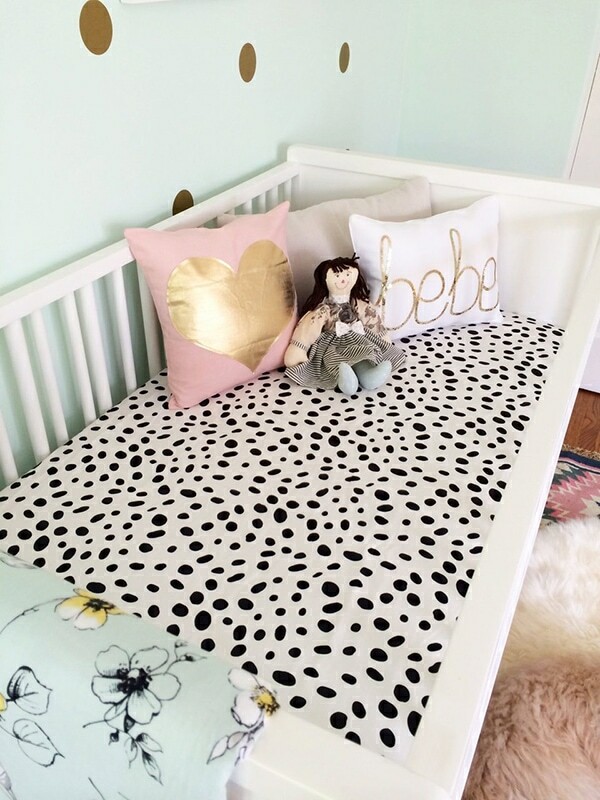 Such a cute nursery! I love your gold dots in the space! I love this nursery! It makes me really want to figure out if we are having a girl or a boy so I can get decorating! That chandelier is insane, and that crib sheet is amazing! I think I’m going to splurge and treat myself to this amazing chandelier for my birthday. I love it so much too. I couldn’t wait until delivery day when I was pregnant, I had to find out. Good luck!